Jesus is like no other person in history. We can barely scratch the surface of who Jesus is and all of the books in the world cannot contain the many works and miracles He performed. Jesus not only claimed to be the Son of God, but proved it through His miracles. His teachings offer the best way to live, His sacrifice took care of everything we’ve ever done wrong, and His resurrection from the dead gives us the hope that we can one day conquer death and be resurrected to live with Him forever as well! If you’d like to discuss who Jesus is, or have questions, we’d love to talk to you! Give us a call (320-398-2992; we respond to messages right away), send us an email, etc. It would be our privilege to share with you who Jesus is and how He can impact your life! We are a casual, friendly place! We know how it can feel walking into a new church. Take a look below to discover a little bit about what happens at our church! Music - Our praise team leads those attending service in a blend of contemporary and traditional songs. Communion - Communion is a celebration for people who have chosen to follow Jesus. You do not need to be a member to take communion (generally the first Sunday of each month). Stemming from the Jewish Passover festival, communion was instituted by Jesus for us to remember His body that was sacrificed to pay for our sins and His blood that initiates a new covenant with us – allowing us to relate to God personally. Message - Pastor Mark's sermon each week shares biblical and spiritual truths through humor and stories. If you miss a week, the sermon is recorded and the audio is available on the website or iTunes. Children - We love children! Maybe they fidget, cry or make some noise during the service. We don't care! They are important to us and important to God! Get acquainted/connected - Everyone is invited to be included in and have access to the "Member/Guest Login" on our website. Under this tab is an online directory, commitee bulletins, prayer information, and more. The church occasionally emails and texts important information and the names/numbers in the directory receive those. Email the church​ to get the ball rolling as to login access. What does it mean to be a member of Lake Union Church? A member is somebody who says, "I'm here. While I'm in this place, and until God leads me otherwise, these are my people and I'm committed here." Also, a member of Lake Union Church can serve in a leadership role and vote at congregational meetings. 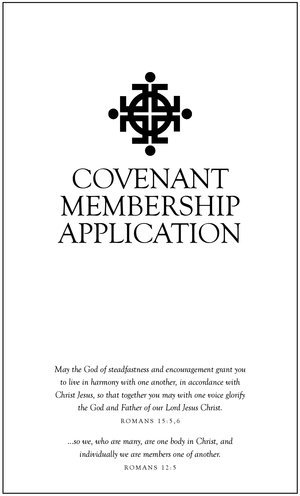 Click here or on the adjacent image to complete and submit your membership application. Pastor Mark will receive the form electronically and will set up a time to meet with you and answer any questions you may have.